It’s hard to believe that just three weeks ago, I was writing a post about how I found motivation from the idea that I was fit enough to not only enjoy hours upon hours of fresh powder skiing, but to handle shoveling out an entire ski lift to earn my turns. Almost a week after surgery on Tuesday to fix my broken wrist and stabilize it using a titanium plate, I am starting to feel more like myself again. I’m down to one or two Percocets a day, if that, and I’m generally getting back to normal. But it’s a new normal, albeit a temporary one. As I focus on physical challenges like making a fist with my right hand (which I can *totally* already do, placing me squarely ahead of where my doctor thought I’d be at this point), and celebrate the fact that I’m letting my body rest rather than getting it moving, I’ve found I need some reminders of the hard-skiing, marathon-running, Chesapeake Bay-swimming rock star I normally fancy myself. That brings me to the talismans of hope with which I’ve started to surround myself. First, a word about talismans. When I looked up the dictionary definition of talisman to find out how to pluralize it (talismen? ), I found it perfectly describes my little collection of feel-good items: “an object held to act as a charm to avert evil and bring good fortune,” or “something producing apparently magical or miraculous effects.” Just what I need! 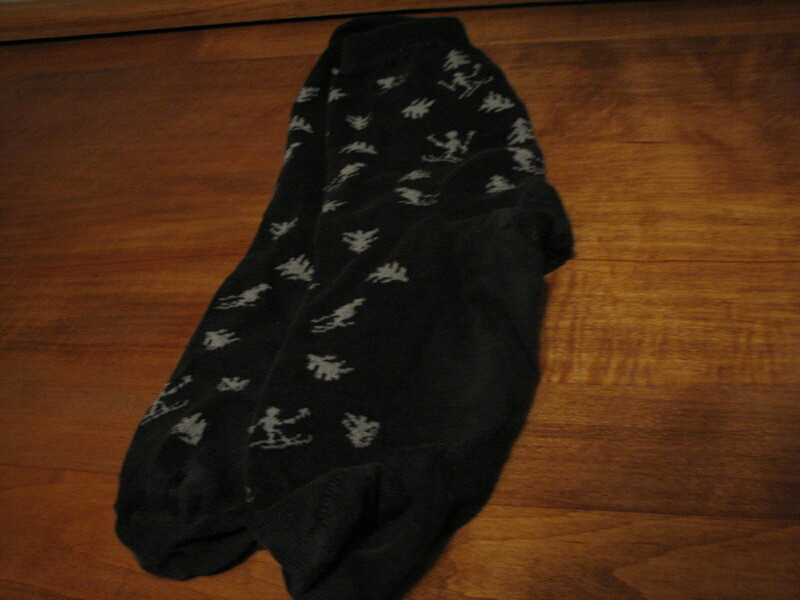 It started with my lucky skier socks on the day of the surgery, which I wore until I had to trade them for the hospital’s “pillow paws,” which were also pretty comfy. It continues with my new favorite shirt: The one I bought at Mount Baker after skiing the you-know-what out of that resort during a visit out West in 2007. The shirt says, “Mount Baker rocks.” But I’m using it more as a reminder that I rock. You can't tell in this picture, but behind the SpongeBob-esque contraption helping to immobilize my arm, I'm wearing a skiing shirt. I have so many T-shirts from road races in open water swims, I have little choice but to wear them to bed on a regular basis. But over the past week, I’ve taken a certain pride in each shirt, relishing memories of actually running the Broad Street Run, the Earth Day 5K, the Run for the Pies 5K in Jacksonville. 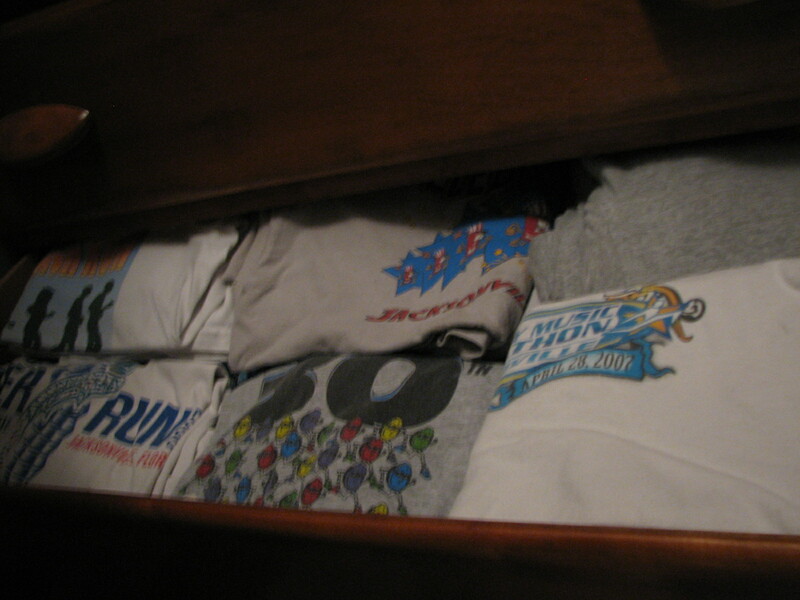 My drawer full of race T-shirts. 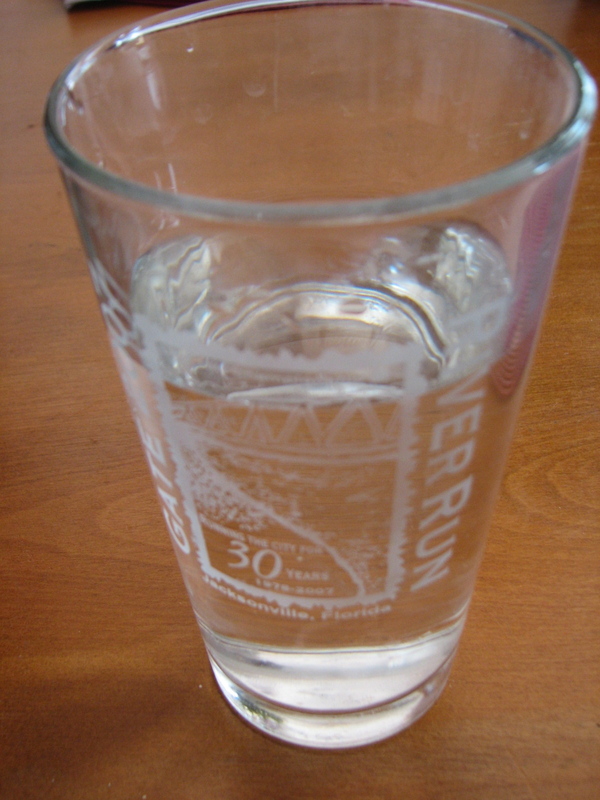 I even wash down my pills with water sipped from my Gate River Run glass. All these things do something I desperately need in order to heal: They remind me that I’m tough, and that I’ve conquered challenges in the past. The challenge I’m facing now is vastly different from these athletic pursuits, but the mental toughness and determination I’ll need to apply to it is the same. I’m staying in touch with “normal me” through my actions, too. I’ve met all my deadlines since first breaking my arm, and I’m proud to share that this story about the Lamond Riggs neighborhood, which I reported, wrote, and took pictures for, was published over the weekend. Tomorrow, I’ll celebrate my first post-op doctor visit–and my one-week anniversary of being done with surgery–by meeting with my running buddies at Pacers Silver Spring for a post-run happy hour. I’ll have to skip the run, but that doesn’t mean I have to skip the happy! Wish me luck at the doctor tomorrow! Best of luck at the doctor! I know what it’s like to come back from an injury. The depression and lack of physical activity is an awful feeling 😦 Keeping lists like this and finding joys in even the smallest and simplest things can keep you going during those times, but even then it’s so easy to fall off the wagon. Keep up the great attitude and best of luck. All of us are rooting for you!